Smoke detectors save lives, but they can only do their job if they work. Contrary to popular belief, the smell of smoke usually does not wake a sleeping person. The poisonous gases produced by a fire numb the senses quickly and put you into a deeper sleep. By sounding an alarm and alerting you to a fire in time to escape, a smoke detector can save the lives of all family members. Install a smoke detector on each level of your home, outside each sleeping area, and in each bedroom. Check each smoke detector monthly by using the test button (or other test feature). Never try to test it with a candle, lighter, or other live flame! Change the batteries in your smoke detector when you change your clock -- in the Spring and in the Fall. Even hard-wired or A/C powered detectors have backup batteries which need to be changed. Spending a few pennies on fresh batteries keeps your detector in top form. Replace a smoke detector when it becomes 10 years old. You can buy a replacement detector at nearly any local hardware or department store for only a few dollars. 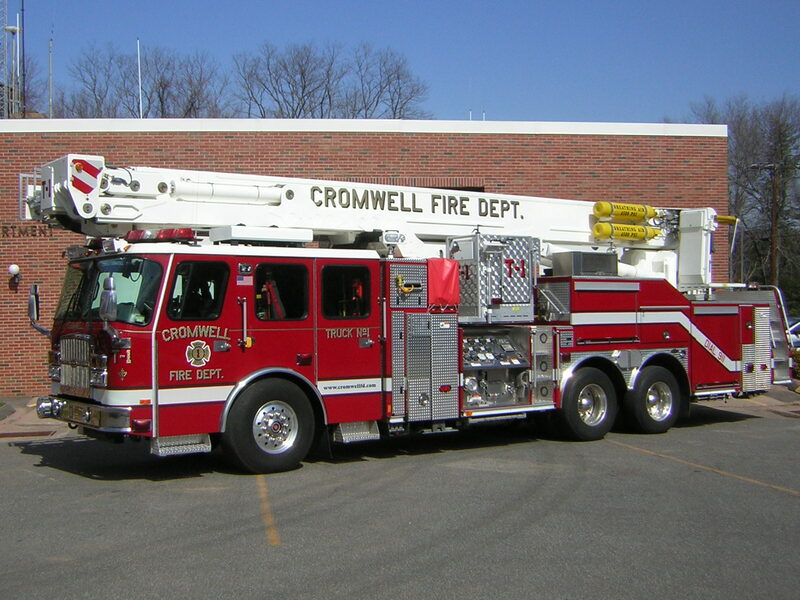 If the cost of the detector is a hardship for any resident of our town, call the Cromwell Fire Department at 860.635.5211 and we will provide a free smoke detector. It's called Project Safe Families -- we're committed to seeing every family in Cromwell protected by working smoke detectors. Because smoke rises, each detector should be high enough to detect the first traces of smoke. Install wall-mounted units 4 to 12 inches from the ceiling. Place a ceiling-mounted detector at least 4 inches away from the wall. In a room with a high pitched ceiling, mount the detector 4-12 inches below the highest point. Along a stairway, install the detector in the path where smoke would travel upstairs. Don't install detectors near windows, doors, or air ducts, where drafts can reduce their sensitivity. If you have any questions about installing your detector, e-mail info@cromwellfd.com or call us at 860.635.4420.